Set amidst the blood and carnage of the First World War, Valiant Hearts is a poignant and moving story of four individuals brought together by themes of revenge, loyalty, loss and love. The adventure/puzzle gameplay may be a little lightweight but that's because the setting, the art-style and the story take centre stage and bring home the dark reality of war on the western front in 1914-1918. The first few moments of Valiant Hearts are powerful stuff. Ripped from his farm, German-born Karl is deported away from his wife and newborn as the gears of inevitable conflict take the world closer to Armageddon. Then, playing as Emile - grandfather to Karl’s child - you find yourself caught up in the mobilisation of World War One, put through boot camp and spat out onto the front line. 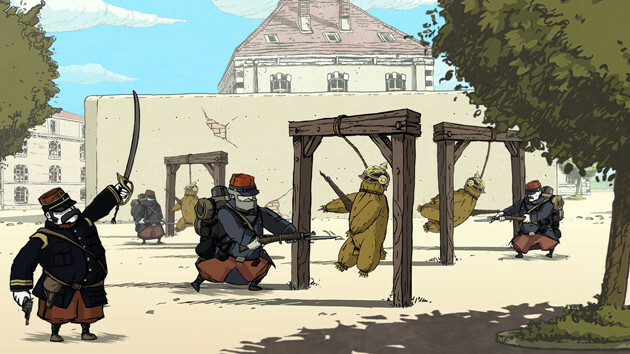 The way Valiant Hearts captures these early moments of the war is a superb example of the UbiArt Framework engine. Though the characters and art-style is cartoony, almost jovial with its stereotypical portrayals of nationalities, cutting that hand-crafted style with the brutal reality of artillery shells and machine gun fire leads to some shocking and moving imagery. 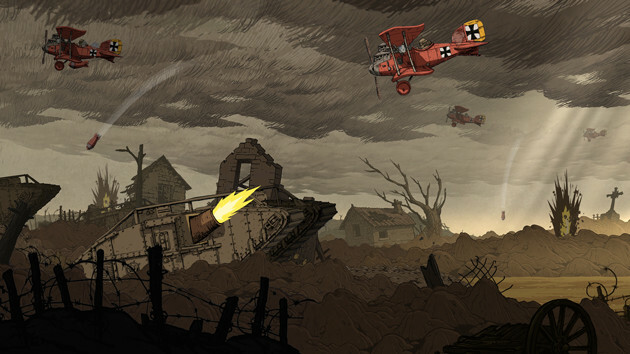 The game itself plays as a 2D platformer with clever use of foreground and background layers allowing you to move around the landscape at certain times in order to escape pursuit or to progress through the battlefields of the western front. 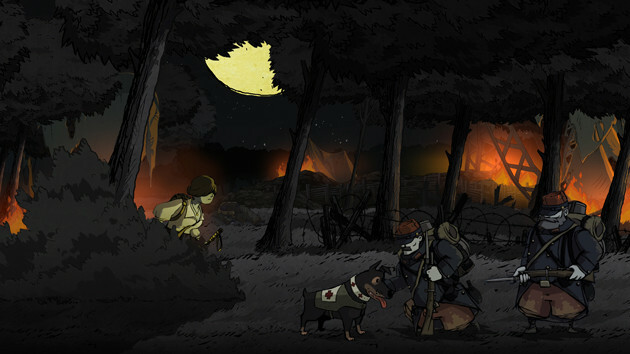 As 2D adventure platformers go, Valiant Hearts is a relatively simple affair with a variety of puzzles to overcome in order to proceed. 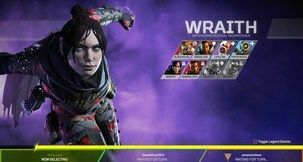 Each character will have their own particular skill - Freddy for example always carries his wire-cutters while Emile can dig through loose soil to access deeper areas of the level. When playing as Anna you’ll be patching up soldiers (from both sides) with a medical mini-game. Most of the time you’ll have Walt with you as well - the Red Cross dog - adding another layer to the puzzles, getting to inaccessible areas or pulling switches so you can get to other platforms. These puzzles sections are rarely taxing and even if you find yourself stumped there’s a three-tier hint system that unlocks if you take too long to figure them out. Breaking up the chapters of the game, Valiant Hearts switches gears quite literally and has you playing a few humorous driving mini-games. From driving French troops to the front in a taxi, to avoiding attack from a giant zeppelin raining down explosive shells, these passages play more like a rhythm game as you avoid obstacles to the beat of some well-known classical music. It might seem odd or even disrespectful to have these entertaining interludes breaking up the story but they add a much needed respite, giving those important moments far more impact. What comes across as clichéd though is the need for a dastardly nemesis. Baron von Dorf is the villain you eventually chase across the western front through most of the game. He’s such a moustache-twirling villain that his inclusion is the weakest link in Valiant Hearts. 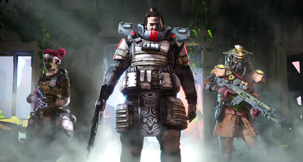 Fortunately his character is not the crux of the game and his appearance ends a few hours before the game reaches its emotional ending. Though I’ve spoken about the gameplay of Valiant Hearts, The simple logic puzzles aren’t the reason you should play or stay away from this game. Valiant Hearts does what few other video games can - it tells a heartfelt story about what living through the Great War was like. It doesn’t do it with heroic, gun-toting soldiers or paint a glorified image of war and violence like so many video game do (some from Ubisoft themselves). 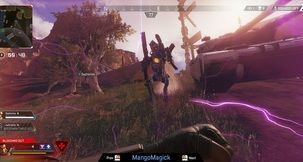 It does it by allowing you to connect with the characters it portrays - Emile in particular is the story’s emotional core - his journey to the front and all the blood, guts and death he sees is done out of quiet duty. Like many who fought through that bitter conflict he sees the pointlessness of it as the latter years begin to play out. I didn't expect Ubisoft would create a game that would do the setting justice, much less honour those who died. But by blending historical fact into its experience with authentic collectables in each level, snippets of real letters sent home from the front and taking you on journey through the bloodiest battles of the war, Valiant Hearts sets out to achieve a unique experience and succeeds. There’s not many video games that treat war with the respect its participants deserve. Metal Gear is too preachy and ham-fisted while Call of Duty & Medal of Honour are bombastic dude-fests disinterested in reality. 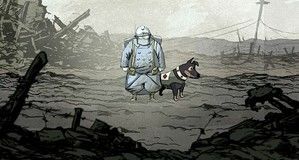 Valiant Hearts, by using the war as a backdrop and avoiding too much direct conflict, pays tribute to the 16 million that perished in The Great War 100 years ago and does it with humour, pathos and melancholy. Avoiding Baron von Dorf’s Zeppelin attack to the music of Carmen.